In Greek mythology, Sisyphus was a king condemned to roll a boulder up a steep slope for all eternity. The gods designed this particular punishment because they knew that hard work without the hope of reward or accomplishment would be the worst fate of all to endure. Yet how many of us feel the effects of this fate every day? We all have our boulders – particular areas or issues where success seems to elude us. The gods in the story made Sisyphus repeat his motions with no chance of every moving forward or achieving gain. In real life, it doesn’t have to be that way. Whether the life-area is attracting a soulmate, more money or losing weight, those boulders represent the same choices or actions we shoulder again and again, with the hope that this time, things will be different. The path to getting unstuck begins with first addressing your life view. What’s your take on the world? Is life out to get you? Is it Us versus Them? Can’t seem to get a lucky break? When it comes to our beliefs, there are those we have chosen and those we have been given. As an adult who takes responsibility for his or her life, it might be time to re-evaluate those beliefs and make more conscious choices. Ask yourself whether or not a belief is helpful, and whether or not it serves you. Viewing life as a battlefield, or a trap, or even a game shifts the focus of responsibility off your shoulders and onto someone or something else. You can’t succeed because of the bad economy; you can’t lose weight because your wife doesn’t cook, and so on and so forth. Viewing life this way also puts you in a position of having to compete against someone else for success, as if there was a limited amount of it here on earth. We live in a school called Life. There are no mistakes, only valuable lessons. A lesson will be repeated until it is learned. Each time a lesson is repeated it becomes more painful. 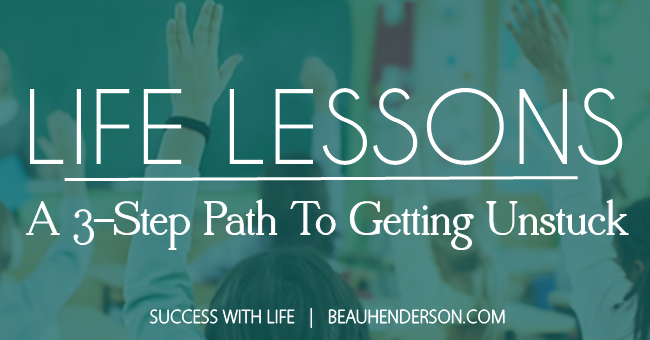 The life school paradigm reminds us that if we aren’t moving forward, it’s because there is a lesson to be learned. When it feels like you’re shouldering the same boulder again and again, that’s a sign alerting you to the potential for personal growth. Once the lesson is identified and learned, then you can move forward, enjoy the summit, or graduate to the next level. Perhaps the most frustrating thing about life school is that the more times the lesson has to be repeated, the more difficult and painful that lesson gets. Like Sisyphus with his rock, your knees might start to give out under the weight, or you might feel at bit battered and bruised. There is a way out from under the rock. At the end of each day, do your Life School homework by practicing these three easy steps. Step #1: Ask yourself, What went wrong? To admit that something isn’t working is one of the most productive things that you can do to get yourself unstuck. Identify where exactly things went astray. Don’t focus on why things went wrong, or how, simply identify the what. It might be as simple as, I got too emotional, or, I was late to the meeting. Step #2: Identify: What did you learn? The key to answering this question is to remember that it’s about responsibility. If your answer sounds even remotely like blame – for example, I learned never to trust So-and-So again! – then I’m afraid you’re off track. The lesson is about you. Not them. You can’t change them, you can only change you. What did you learn about you? Examples might be, I learned that I need to ask questions more succinctly, or, I need to leave ten minutes earlier. Step #3: Propose a solution: What’s your new plan? Before you release the mistake and move on, it’s vital to your growth as a human being to identify what you will do differently next time. For those with a heavy conscience, you will only feel at peace when you come up with a new plan. What does a plan look like? It puts you in charge and identifies what you can do to increase the chances of a positive outcome. Plans that relate to our earlier examples might be something like, I will write my questions down, or, I will leave for work at seven-thirty. Don’t spend energy on going backwards, assigning blame or looking for why. Give up the futility of pushing rocks up hill. Instead, take your regrets, your mistakes, and your missed opportunities and hold them up to the inner screen of your mind. Ask yourself, what can I learn here? Then apply the three steps: what went wrong, what did I learn and what’s my plan? Want a shortcut to getting your RichLife back on track?